Some months ago I reviewed a Microgaming slot called Asian Beauty, an Oriental-inspired game filled with lotus blossom, Geishas and fans, all topped off with a lovely Chinese-style soundtrack. 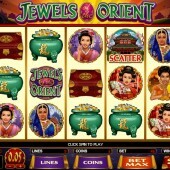 Slot developer Microgaming are obviously hot for the Asian vibe as their Jewels of the Orient slot proves. A 5 reel, 9 pay-line slot with betting starting at just $0.01 a coin, chances may be hard to come by in Jewels of the Orient, but at 20 coins a line there’s still scope to bag a nice win. This will be music to the ears of slots players that want to enjoy their slots and be able to have the big win potential without blowing their budget. Cherry blossom plays a part in this game too, and trees adorn reels packed with various Oriental beauties – each animated in a different way when forming a winning combo – plus gold, temples galore, boxes and the Jewels of the Orient logo. Winning combos spring to life in animated glory, like the jewel boxes that burst open to reveal gold and treasure when forming a winning combo. The logo itself acts as the game’s Wild, and substitutes for all symbols other than the Scatters. Five Wilds across the reels awards a 2,500-coin jackpot. Three or more Scatters – the Emperor’s Palace icon – anywhere on the reels triggers a free spins round. The more Scatters you hit to trigger the round, the more spins you’ll win. Not only that, but there’s an increasing multiplier plus bonus multiplier applied to all wins: Three Scatters awards 10-15 spins with a 1x-5x multiplier plus an additional win of 25x your total bet; four Scatters gives you 15-20 spins with a 1x-5x multiplier and a bonus win of 100x your total bet, and finally, five Scatters gives you 20-40 free spins. Again, a multiplier of 1x-5x is applied but you’ll receive a bonus multiplier on your bet of 50x-120x. 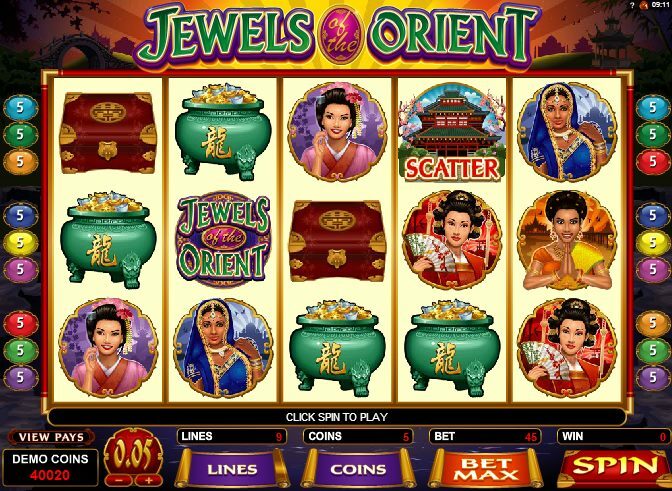 With some pretty graphics, nice overall feel, and cracking free spins bonus round (even though they can’t be re-triggered), Jewels of the Orient could prove to be the real jewel in your Asian slots arsenal. If it’s tempted you for more Oriental-inspired games, the aforementioned Asian Beauty is worth a punt, as is Novomatic’s sumptuous Japanese-set slot, Katana.